By the age of 15, Daivd Rodigan was DJing at school dances and youth clubs. The infectious, crazy back beat of Jamaican Ska first capitivated him as a teenager in the mid 60's; it was a driving, energetic sound which he found impossible to resist. When the pace cooled down and condensed into Rocksteady David was equally enamoured because the sweet, arching vocal style of Jamaica's young stats could be heard to full effect. The music was fresh, original and soulful. His fascination for these sounds became an obsession as he began what was to e a life-long love affair with the music of Jamaica and for the past 30 years he has had the privilege of playing these songs on the radio and in clubs. In 1978, David Rodigan obtained a job on Radio London to alternate with Tony Williams on the Reggae Rockers programme. A year later he was offered a permanent slot at Capitol Radio to present Roots Rockers, which ran for 11 years. When Kiss FM re-launched in the early 90's as London's first legal 24-hour dance music station, they offered David Rodigan a show where he currently hosts the Sunday night slot from 11PM till 1AM. By way of celebration, he has chosen a collection of tracks which encompass the positive aspects of real authentic reggae; essential, classic recordings, some of which have become gloriously obscure antiquities whilst more recent hits are also embraced. 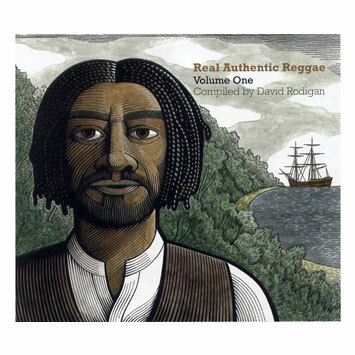 May these songs bring to you the magic of a unique, inspiring music which took life in the bustling dancehalls of Jamaica 50 years ago. We are also proud to present cover artist Clifford Harper. The slf-described "anarchist and cartoonist" was born in 1949 in West London. In the 1970's he began to work as an illustrator, mainly for the radical movement, this led gradually to more mainstream work. Since the 1980's his work has appeared regularly in all the major newspapers in Britain and in the last few years he has become one of The Guardian's most popular illustrators. We are pleased to say he will illustrate the covers for all 5 volumes of this compilation series by David Rodigan.